In this post, reviews for: Sabina Murray’s Tales of the New World (Grove Press, 2011); Catherine Chung’s Forgotten Country (Riverheard Books, 2012); Molly Gaudry’s We Take Me Apart: A Novel(la) (Mud Luscious Press, third printing, 2011); Swati Avasthi’s Split (Borzoi Books, 2010); Krys Lee’s Drifting House (Viking, 2012); Paul Yee’s Money Boy (Groundwood Books, 2011). With Tales of the New World, Murray makes a triumphant return to the short story form, as this particular collection dramatically showcases her ability to plumb history and reconfigure it for the fictional world. Tales of the New World might be more accurately called a story cycle, a loosely linked set of tales that achieve richer texture because they have a thematic focus. In this case, all of the major characters in each short story collection are explorers in some form. Tales of the New World opens with “Fish,” which focuses on the life and adventuring of Mary Kingsley, a pioneering figure in that she obviously went against gender norms to follow a path of globe trotting. What makes Murray’s ability to weave history back into fiction so unique is that she always approaches each social context from an inventive angle. For instance, in “Fish,” Murray will breathe more life into Kingsley’s romantic background or lack thereof, the challenges that arise for the simple fact that she is so devoted to her exploration. One of the most formally experimental pieces in Tales is “Paradise,” which includes a idiosyncratically inquisitive narrator, one who ruminates on the historical context of Jim Jones, an apparent cult leader who perpetrated what is called the Jonestown massacre in British Guyana in 1978. What is obviously clear is that Murray stages this collection as a way to complicate how civilization and savagery is defined. We are always and consistently having to reconsider the purpose and the intent of exploration, what it accomplishes and what it cannot. The brilliance of this work can be seen in a story like “Balboa.” Early on, the titular Vasco Nunez de Balboa is described as the “divining line between the modern and the primitive. As he moves, the shadow of Spain moves with him” (212). But, the story seems to suggest that this “line” between the modern and the primitive is not so easily defined: “Balboa is loved by no one and feared by all. He has invented an unequaled terror. The Indians think of him as a god. They have seen his soldiers tear babies from their mothers, toss them still screaming to feed the dogs. They have seen the great dogs pursue the escaping Indians, who must hear nothing but a great panting, the jangle of the dogs’ armor, and then, who knows?” (271). These stories make us wonder about what it means to be a god that inspires such terror and that if this “god” is apparently the embodiment of the modern, exactly what trouble has the establishment of civilization gotten everyone into? A collection of deep texture, one that encourages you to delve further into engaging nonfictional accounts that ground the stories as well as the philosophical questions that come with process of discovery. 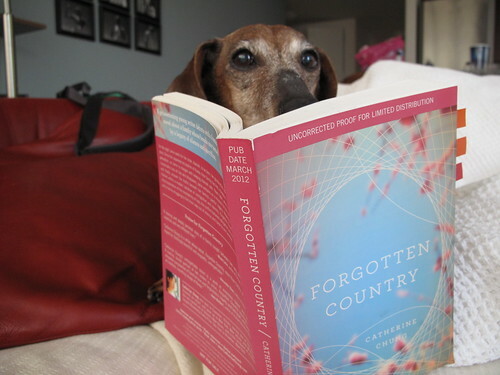 A Review of Catherine Chung’s Forgotten Country (Riverheard Books, 2012). There is much to commend about Catherine Chung’s lyrically lush and elegiac debut novel, Forgotten Country. We’re gifted with a first person narrator who gives us so much to sink our teeth into as readers—her nuanced observations and sure storytelling voice always anchors us. The protagonist, Janie (Jeehyun), is a doctoral student in mathematics who must deal with two big family crises, one involving the sudden disappearance of her sister, Hannah (Haejin), and another involving the terminal stomach cancer diagnosis that her father has received. Her parents decide that it is best to move back to Korea for treatment, while Janie attempts to track down Hannah to see if some sort of familial rapprochement can be made. It is unclear for most of the novel why Hannah wanted so radically to break ties with her family, but Janie does read Hannah’s distance as a kind of betrayal. When it becomes apparent that Hannah will not easily be persuaded to return to the family despite their father’s condition, Janie travels to Korea to be with her family. Much of the novel patiently reveals the tragic circumstances of her family’s immigration to the United States. Janie’s father, once a brilliant student himself, had written a controversial and politically engaged pamphlet denouncing the Korean government in the wake of the Kwangju uprising; they travel to the U.S. under asylum, but must leave behind their extended family and struggle to make new lives. Once in the U.S., Hannah and Janie must contend with the arrival of their Aunt (their father’s sister), a particularly dour woman and mother of two sons; this connection will have major ramifications (especially for Hannah) over time. Further still, Janie’s mother harbors considerable trauma over the ill-fated disappearance of her own sister, presumably kidnapped by North Korean authorities. Rather than make any claims to her disappearance and incite possible political scrutiny, Janie’s mother’s family simply covers up the circumstances and pretends as if she has died. With all such family secrets and histories coming to the surface, Chung writes a novel that elegantly dispels the model minority ethos. Indeed, Janie’s own doctoral dissertation becomes secondary to being with her father has he slowly succumbs to metastatic stomach cancer. And though the novel does not end with a felicitous family reunion and hope for a united future, it does show us the tremendous costs related to immigration—how young children will come to leverage their futures on what the literary critic erin khue ninh denotes as a kind of unbearable sacrifice that can finally never be repaid. And of course, Catherine Chung’s Forgotten Country adds to the growing body of work that has focused more largely on contemporary Korean and Korean American social contexts (alongside other books reviewed on this site, including Sonya Chung’s Long for this World, Samuel Park’s This Burns My Heart, Sandra Park’s If You live in a Small House) a welcome shift in the publication realm that has expanded the kinds of fictional worlds we read. A Review of Molly Gaudry’s We Take Me Apart: A Novel(la) (Mud Luscious Press, third printing, 2011). I didn’t have any expectations when I opened We Take Me Apart, which was a finalist for the Asian American Writers’ Workshop award in poetry. Certainly poetic, this work, described as a novel(la), is as much prose as it is lyric. There is an obvious attention to sound quality and fragment, which makes We Take Me Apart akin to something like Kazim Ali’s Bright Felon. The work opens with an epigraph from Gertrude Stein, so we can expect a lyric narrative filled with word play and linguistic innovation. We Make Me Apart does not disappoint on this level; there is a circularity and allegorical quality to the lyrics that give it a sublime cohesion. The novel(la) primarily focuses on two competing strains: the revision of fairy tales and then the relationship between a mother and daughter. The opening of We Take Me Apart reads thus: “Long Ago/ in a different version/ it was not a glass slipper but a glass dress/ it was not beautiful/ it was not flowing like a stream/ it did not have a train wider than an acre/ in this version everyone could see everything/ nothing was left to the imagination” (1). This opening accomplishes a couple of different things for the impending lyric narrative. On the one hand, we obviously know this will be a story involving reworkings of Cinderella, but on the other, there will certainly be a “de-Disneyfication” where another narrative will be bared, one which will not turn away from perhaps the more dark and ominous tones of folktales, myths, and fairytales. We are not surprised that on page 3 when cannibalism occurs, as this is a tale filled with mournfulness and violence. After reading through the work a number of times over the past couple of months (I kept this work next to my bedstand because I knew it would require re-reading), the element that I find most compelling is the class politic explored in the work. The relationship between the mother and daughter is one infiltrated by labor, as the daughter must see her life unfold amid poverty and the constant service that her mother must provide for other families, such as cooking and cleaning. The cannibalism sequence on page three re-reads then as a kind of metaphorical consumption of the laborer’s service work, one that always goes unnoticed. The daughter will grow up to sew dresses for other people. The work of creativity in the construction of the dresses is important for the daughter to be able to carve out a sense of her own identity and freedom, despite the fact that she is so strongly burdened by the expectations of labor and servitude. At some point, there is a clear rupture between mother and daughter and the loss of this relationship structures a melancholic tone to the work as we move into the final half. Though the relationship between mother and daughter is not what we would call endearing, the daughter still retains considerable respect and even love for this figure, who brings to bear the complications of a world filled with toil and work. Amid this stark environment, Gaudry’s gorgeous lyric voice guides us through. A Review of Swati Avasthi’s Split (Borzoi Books, 2010). A Review of Krys Lee’s Drifting House (Viking, 2012). It’s too bad that short story collections are not as popular as they once were; it seems that every year fewer and fewer collections are being published. Interestingly enough, I believe it to be one of the most innovative and dynamic forms for Asian American writers, many of whom have published brilliant collections. 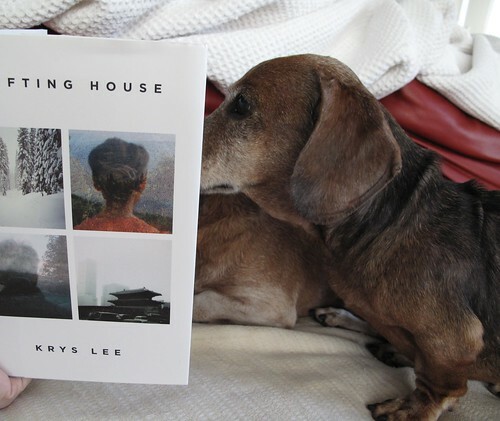 Krys Lee’s debut, Drifting House, is most often reminiscent of a minimalist style that has been used to great effect by others such as Jhumpa Lahiri, Paul Yoon, Mary Yukari Waters, and Yiyun Li, though Lee occasionally strays from this aesthetic comfort zone in the occasional first person or second person narration. Like most short story collections I’ve read lately by Asian American writers (most recently for instance Xu Xi’s recently reviewed Access), Lee’s narratives take flight in the domestic terrain of Korean and Korean American family relationships made unstable through transnational movements. For instance, the opening story, “A Temporary Marriage,” focuses on Mrs. Shin, a woman who gets a green card marriage in order to search for her daughter, Yuri, who has been taken by her husband to the United States. Though Mrs. Shin at first is leery of her green card husband, Mr. Rhee, she eventually grows to depend on him and even develop some feelings of affection for him. Using the help of a private detective, Mrs. Shin eventually tracks down her daughter, but her reunion is far from the felicitous moment she had hoped. “At the Edge of the World” focuses on a precocious young boy, of mixed Chinese Korean parentage must negotiate the tense relationship between his biological mother and stepfather, who end up together as a result of their collective refugee status. My favorite story, “The Goose Father,” explores the idiosyncratic relationship that develops between an aged Korean man and a renter. Lee’s stories are more largely notable because they often move between Korea and the United States, providing us with a transnational aesthetic more largely seen in other Asian American short story collections, including Angie Chau’s Quiet as They Come and Aimee Phan’s We Should Never Meet. Further still, Lee is part of a new generation of Korean American writers to really focus on representing (post)modern Seoul (see the excellent second person narration from “The Salaryman” for instance) with all of its density and vertical stratification. Another definite must-read for Asian American literature fans. A Review of Paul Yee’s Money Boy (Groundwood Books, 2011). Paul Yee’s Money Boy focuses on 15 year old Ray Liu, a teenager and Chinese immigrant living in Canada, who is expelled from his home after his father discovers that he is queer. The title refers to the Chinese term for men who prostitute themselves. After living for a couple of days on the streets and suffering from hunger and theft of personal property, Ray turns to hustling on Church Street (in Vancouver). He eventually loses his virginity to an older man named Han, who later turns out to be a pimp. Toward the end of the novel, Ray must make a choice between his new life as a money boy or returning home with his father, who in some sense, has dealt with the fact that his son may be queer. Pylduck writes: “As with other YA writing, this novel offers a very deliberate and guiding narrative voice. We follow along (in the present tense) with Ray's story as it unfolds. The story begins with Ray watching a movie based on Shakespeare with his Chinese immigrant classmates. There is a lot in the novel about the particular experiences of being a new immigrant as a teenager—issues of language and cultural divides that overlay the usual high school drama of cliques. He tells us about his obsession with a Chinese MMORPG (massively-multiplayer online role playing game) Rebel State. And then his father finds that he has been visiting gay websites and kicks him out of the house. The bulk of the novel concerns Ray's journey into Toronto's gay subculture and the underworld of prostitution.” My plot summary didn’t refer to the importance of the MMORPG, but it is absolutely central to Ray’s life. Indeed, so important is the MMORPG that part of the reason why he turns to selling his body is so that he can get the funds to replace the laptop that was stolen from him. And certainly, Yee is intent on exploring the “underworld of prostitution,” though Ray’s characterization is fascinating in that he seems to be relatively unfazed by having to sell his body. Indeed, if there is a critique to be made of the novel, it is that the first person narrative voice can seem unrealistic (at least to me). And there were certainly other points where Yee absolutely focused on the flaws of the narrator, so much so that it was hard often to retain sympathy for Ray. Much of course can be attributed to the narrator’s relative immaturity. As for Toronto’s gay subculture, one area where Ray begins to develop a sense of family outside of his nuclear one appears in the form of the restaurant and establishment known as Rainbow Sushi. Here, some of the employees help him to see other ways to form bonds among other queer men. Like Swimming in the Monsoon Sea, Ash, and other such works, queer thematics do find some resonance in these young adult-oriented fictions, suggesting of course that a change in the attitudes of what is deemed to be appropriate for teen readers. In this respect, Yee’s Money Boy has done some important political work that imagines the possibilities of survival for the young queer Asian North American subject. Gah, I have to get my hands on Money Boy! It looks so awesome. I liked Split a lot better, though it's not a queer story. Re: discussion question about happy endings (no double entendre intended), I don't know. I've read some pretty bleak YA books, and I've been thinking about whether or not they end optimistically or not.... My favorite YA book this past year is Brian Farrey's With or Without You (I might've mentioned it in comments on this comm earlier, even though it's not Asian American).... and I wouldn't characterize the ending of that novel as happy or one that offers a solid sense of closure that we often expect from narratives. It's very interesting. Someone should write about endings in YA literature. The problem with a project like that is that there are so many YA books. I don't know the statistics, but it at least seems like there are way more YA books published each year than adult books, if only because authors in the genre tend to have many, many books under their belts. Dogs! I picked up Sabina Murray's collection at the library. I love short story books that are themed. Don't know if I'll actually get around to reading it anytime soon, though. Still haven't read anything by her.